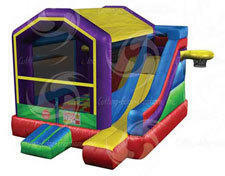 Everyone enjoys a party, and this unit offers all kinds of playful fun for up to 6 patrons. Our Wacky 5-in-One Bouncer Combo has a colorful look and a big optional digital panel area! When used without a panel, this playful combo unit offers unparalleled visibility!